Quick and easy to make, this vegetable wonton soup is full of flavour and can be as spicy or as mild as you like it. 1. Place the mushrooms and broccoli florets in a large bowl, add the olive oil and Chinese five spice. 2. Mix well and then add the salt and pepper. 3. Prepare the wonton parcels by using the mushroom and broccoli mixture as the filling and set aside. 4. In serving bowls, add the chopped spring onions, salt, light soy sauce and sesame oil. 5. 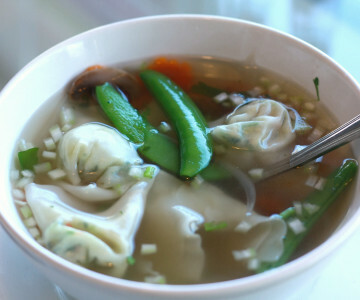 Boil the water or vegetable stock in a wok and add the wonton parcels. Simmer for around 4 minutes. 6. Divide the wonton soup between 4 serving bowls, drizzle with the sesame oil and garnish with the flat leaf parsley leaves. Top tip: For a more spicy vegetable wonton soup, add a teaspoon of vinegar and freshly chopped chilies into the serving bowl.